Heat a large Dutch oven over medium-high heat and brown the meat all over until deep golden brown on all sides. Remove the meat to a plate. Add the onion to the pot and let cook for a few minutes and then add the bourbon and beer scraping up the brown bits on the bottom of the pot. Let cook out for a few minutes and add the stock. Add pork back to the pot, bring to a simmer, cover and place in oven for about 2.5 hours or until fork tender. When finished and cool enough to handle, cut off string, pull apart and store in the liquid. For the Pineapple Pico de Gallo: Combine onion, chili pepper, lime juice and a fat pinch of salt and let sit for a few minutes. Add the cilantro and pineapple and stir to combine. To serve, place some cabbage on the bottom roll, then a serving of pulled pork, and top with Pineapple Pico de gallo. Place top roll and enjoy. In Recipes-list.com we have selected the most viewed recipes from category - uncategorized . Enjoy the best recipes specially selected for you! 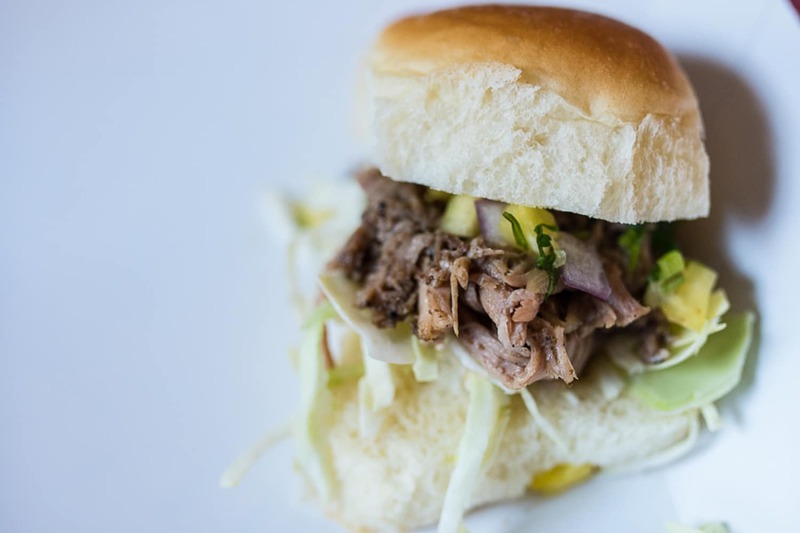 Beer and Bourbon Pulled Pork Sliders is the right choice that will satisfy all your claims.